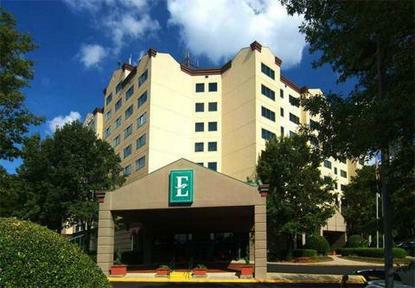 Welcome to The Embassy Suites Hotel - Raleigh, North Carolina This beautiful full service all-suite hotel is centrally located in the heart of Raleigh at Crabtree Valley, often considered shopping central. Our hotel is close to many Raleigh attractions, located across from the Crabtree Valley Mall, less than five miles from North Hills Mall- offering specialty boutiques restaurants, the RBC Center- home of the Carolina Hurricanes, Carter Finley Stadium, North Carolina Museum of Art, and much more Enjoy all that the Embassy Suites Raleigh-Crabtree Hotel has to offer. The hotel boasts Nicola's Ristorante offering exquisite Italian and American cuisine in a casual atmosphere, over 3,200 sq. ft of flexible meeting space, a beautiful indoor pool and whirlpool, recently updated fitness center, and a computer work station with printing capabilities for your convenience. In addition, the hotel offers complimentary transportation within a two-mile radius based upon availability, and to and from RDU International Airport. The Embassy Suites Raleigh Hotel offers 225 two-room suites that are each equipped with the Embassy Essentials package featuring Suite Dreams bedding, plus mini refrigerators, microwaves, and all of the comforts of home. Guests of the hotel receive complimentary cooked-to-order breakfast and a nightly manager's reception. Wireless high-speed internet access is available at this North Carolina hotel for a nominal fee. The Embassy Suites Hotel has all that is needed to create the perfect Raleigh, North Carolina vacation. For the Best Rate Guaranteed with no booking fees, book your North Carolina Hilton hotel room online today at embassysuites.com. Embassy Suites Raleigh-Crabtree Hotel is just minutes from Downtown Raleigh including Glenwood South, Raleigh-Durham International Airport, North Carolina State Capitol, Raleigh Convention Conference Center, Cameron Village and Triangle Town CenterMuseums- Exploris with IMAX Theatre, North Carolina Museum of History, North Carolina Museum of Science,Alltel Pavilion*North Carolina State University-NCSU, Meredith College, Shaw University, Peace College, North Carolina State Fairgrounds, Progress Energy Center for the Performing Arts,Embassy Suites Raleigh-Crabtree Hotel is a short drive to Research Triangle Park- RTP, The Streets at South Point Mall, Duke University, University of North Carolina at Chapel Hill.